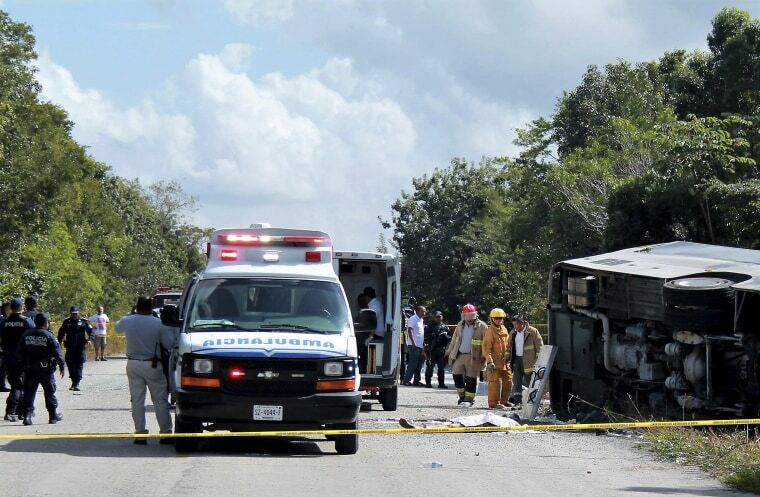 CANCUN, Mexico — Driver negligence and speed likely caused a bus crash in southern Mexico that killed eight Americans, two Swedes, one Canadian and a Mexican tour guide as they traveled from cruise ships to visit nearby Mayan ruins, officials said Wednesday. "Due to a lack of care the driver lost control of the bus' steering to the right, leaving the asphalt," state prosecutor Miguel Angel Pech Cen said at a news conference. He said evidence found at the scene indicated the driver was going too fast. The state government said that in addition to the 12 people killed, three Canadians, four Brazilians, four Americans and two Swedes had to be hospitalized for treatment of injuries. The two Swedes were transported to the United States for treatment. Seven other people were slightly injured in Tuesday's accident and returned to their cruise ship. By Wednesday afternoon, only four tourists — one Brazilian and three Americans — remained in local hospitals, the state prosecutor's office said. A state government statement early Wednesday said the bus driver was injured and taken into custody. But Pech Cen later said the driver was not in custody. He said the driver was transported from the scene for medical treatment. They knew the driver's identity and would get a statement from him, but were not sure if he was in a hospital or still at home, the prosecutor said. He did not elaborate on the conflicting government statements. The prosecutor later clarified that authorities could not detain the driver based on what investigators had gathered thus far, but officials took down his information before transferring him to the hospital to receive medical attention. Pech Cen noted that authorities would continue to investigate the driver and get his statement as they determined his degree of responsibility for the crash. Meanwhile, the Swedish and Canadian governments confirmed the deaths of their citizens, but the U.S. Embassy in Mexico City confirmed only that there were "multiple" American deaths and several injuries. A statement said the embassy had staff on the ground assisting victims and loved ones. "We express our heartfelt condolences to all those affected by this tragedy," State Department spokeswoman Heather Nauert said in Washington. Haim Shababo of Fort Lauderdale said Wednesday that his mother-in-law, Fanya Shamis, was among the bus passengers killed in the crash. "We are waiting for the bodies to come home," he said. He said the family had no additional information to provide at this time. Chris Brawley, of Haslet, Texas, was on one of the two cruise ships that had passengers on the crashed bus, and he was en route to the ruins as well. He said his bus passed by the accident just minutes after it occurred, and he observed skid marks on the dry pavement. Brawley said the ship he was sailing on, the Serenade of the Seas, sailed out of Mahahual on Tuesday around 5:30 p.m., a couple hours after its scheduled departure. It was docked Wednesday up the coast in Cozumel. "Captain informed us this morning one of our passengers passed overnight," Brawley said. Associated Press writers Christopher Sherman in Mexico City and Jennifer Kay in Miami contributed to this report. Daniel Arkin and Phil McCausland contributed.